Deschutes Brewery, named after the river the runs through Bend, started in 1988 and is now the fifth-largest US craft brewer. BEND, Ore. — “This place has a guerrilla underground, bad-boy vibe,” our pub tour guide said as we entered the Boneyard Brewery. An old jeep with the company’s skull-and-crossbones logo sat near the front door of the industrial-looking warehouse, tucked into the middle of a quiet neighborhood of bungalows. The small, no-frills tasting room, plastered with posters and lined with shelves of Boneyard merchandise, was standing room only. We jockeyed for space among a steady stream of locals, who had come to fill growlers and chat with the owners. After hearing a brief history of the brewery, we sampled Femme Fatale, a fruity ale that our guide called “a breakfast beer,” and Diablo Rojo, a unique, tasty, malty red ale. No wonder this tiny but growing artisan brewer is causing a buzz. But it’s far from the only game in town. Dubbed “Beer Town USA,” this lively, outdoorsy mountain city of more than 80,000, located on the eastern ridge of the Cascades, has more craft breweries per capita than any other city in Oregon. The Bend Ale Trail leads to 11 of them in Bend proper, complete with a map and passport that you can get stamped at each brewery to receive a prize. Call us lightweights, but visiting 11 breweries in three days sounded a bit too ambitious and would leave little time for exploring the other sights in Bend. The city, a three-hour drive southeast from Portland, boasts gorgeous scenery, abundant outdoor recreation, and a lively vibe, making it one of the coolest and most eclectic mountain towns in the country. It wasn’t always the case. Two decades ago, the last of the timber companies pulled out of Bend, leaving it a near ghost town. But in recent years, people with energy and ideas have discovered Bend, drawn to its beautiful setting and laid-back, friendly atmosphere. Today, the comeback town is hotter than ever. We started at the Deschutes Brewery, where the city’s renaissance likely began. 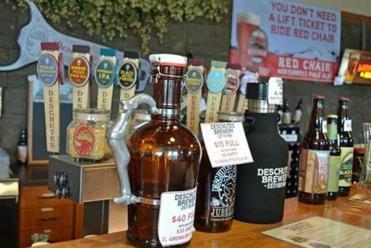 Two-and-a-half decades ago, Deschutes Brewery handcrafted its first ale. Today it’s the fifth-largest craft brewer in the country. It’s also where many of Bend’s other craft brewers honed their skills and fueled passions before venturing out on their own. We toured the high-tech facility, filled with German precision machines and a state-of-the-art bottling assembly line, and then headed for the best part of the tour: the tasting room. If you go to Bend, Ore.
“Try this first,” a bearded bartender said, passing us a small glass of Cascade Gold Ale. “We consider it our gateway beer.” The English-style blond ale was smooth and crisp. We ended the tasting with a short glass of the number one selling draft porter in the nation, the flagship Black Butte. The rich, potent brew is made with locally roasted coffee and aged in whiskey barrels. The line up of craft brews is a familiar sight in Bend, the city dubbed Beer Town USA. It’s a sentiment we heard over and over again from locals. “It’s like Disneyland for people who like to be outdoors,” said Drew Bledsoe, former New England Patriots (and Buffalo Bills and Dallas Cowboys) quarterback, who lives with his family in Bend. His wife, Maura, grew up in Portland. She wanted to return there; Bledsoe was more interested in Montana. “We came to Bend as a compromise,” he said. And, they haven’t looked back. The city is surrounded by mountain peaks, alpine lakes, and acres of wilderness. 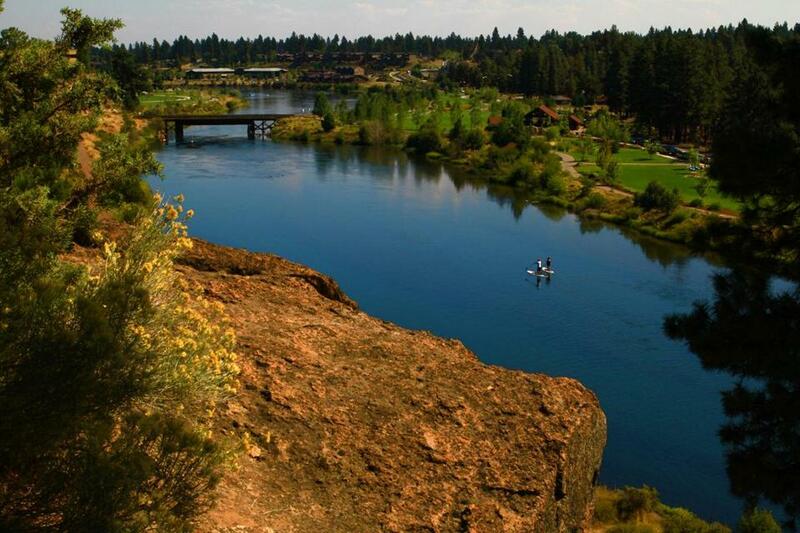 Within Bend, there are more than 70 parks and 51 miles of trails, and just a short drive away are hundreds more miles of cross-country and hiking trails. Mountain biking, rock climbing, and fly-fishing are popular warm-weather activities. In winter folks head to Mount Bachelor for first-rate skiing and snowboarding. “Nowadays, a lot of people can work from home. And if you’re looking to start your own business, why not here?” a shop owner said, with a nod to the outdoors. Obviously, a lot of people were on the same page. In 2012, Entrepreneur magazine named Bend the most entrepreneurial city in the country. Locally-owned boutiques, wine shops, coffeehouses, and trendy restaurants line the downtown streets. We ended our pub tour at the Silver Moon Brewery. Our guide told us that the original owner started it with used equipment he bought from a brewery in Willamette Valley. “The problem was, it was the dead of winter and snowing like crazy when he went to pick up the equipment,” he said. He loaded up his flatbed truck and trailer and came back over a narrow, two-lane, winding, slippery mountain pass. We lifted frosty glasses of Silver Moon’s Bridge Creek Pilsner and toasted the can-do attitude that permeates this fun town. Correction: Because of a reporting, an earlier version misidentified Gary Fish.